Usage Based Insurance and Big Data – What is a Carrier to Do? There is little doubt that Usage Based Insurance (UBI) (a.k.a. 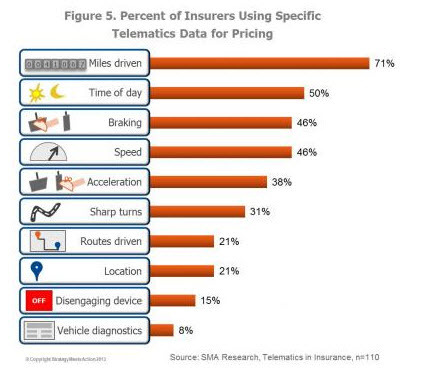 Telematics) is a hot topic in the U.S. Insurance Market. A recent survey from Strategy Meets Action found that while only 18 P&C insurers have an active UBI program in more than 1 state, 70% of insurers surveyed are in some stage of planning, piloting, or implementing UBI programs. A carrier cannot venture into this space without considering the data implications. Usage Based Insurance, whatever its flavor, involves placing a device in a vehicle and recording information about driving behavior. Typical data points collected include: vehicle identifier, time of day, acceleration, deceleration (i.e. braking), cornering, location, and miles driven. This data can then be paired with publicly available data to identify road type and weather conditions. Now consider, a 20 mile morning commute to work that takes the driver 35 minutes. If the data points noted above (9) are collected every minute, that 20 mile commute would generate 315 data points (about 16 data points per mile driven). If the average vehicle is driven 1000 miles in a month, it would generate 16,000 data points each month or 192,000 data points each year. Now consider what happens if a carrier enrolls even 1000 vehicles in a pilot UBI program. Within a year, the carrier must accommodate the transmission and storage of over 190 million data points. Progressive Insurance, the leader in UBI in the U.S. market, has been gathering data for 15 years and has collected over 5 Billion miles of driving data. Even more critically, the carrier must find a way to interpret and derive meaningful information from this raw driving data. The UBI device won’t magically spit out a result that tells the carrier whether the driving behavior is risky or not. The carrier must take this raw data and develop a model that will allow the carrier to score the driving behavior in some way. That score can then be applied within rating algorithms to reward drivers who demonstrate safe driving behaviors. As with all modeling exercises, the more data used to construct the model, the more reliable the results. While data transmission and storage costs are relatively inexpensive, these are still daunting numbers, especially for small and mid-sized carriers. How can they embrace the changes that UBI is bringing to the market? From a pragmatic perspective, these smaller carriers will need to partner with experts in data management and predictive modeling. They will need to leverage external expertise to help them successfully gather and integrate UBI data into their organizations’ decision making processes. In the longer term, credible 3rd party solutions are likely to emerge, allowing a carrier to purchase an individual’s driving score in much the same way that credit score is purchased today. Until then, carriers need to make smart investments, leveraging the capabilities of trusted partners to allow them to keep pace with market changes. “Big data” seems to be yet another catch phrase that has caught many in healthcare by surprise. They’re surprised for the same reason I am which was recently summed up for me by a VP of Enterprise Informatics at a 10 hospital health system – “how can we be talking about managing big data when very few [providers] embrace true enterprise information management principles and can’t even manage to implement tools like enterprise data warehouses for our existing data?” Most people in healthcare who have come from telecommunications, banking, retail, and other industries that embraced Big Data long ago agree the industry still has a long way to go. In addition vendors like Informatica who have a proven track record of helping industries manage Big Data with their technology solutions, still have yet to see significant traction with their tools in healthcare. There are plenty of other things that need to be done first before the benefits of managing Big Data come to fruition. Have we been here before? Didn’t we previously think that EMR’s were somehow going to transform the industry and “make everything simpler” to document, report from, and analyze? Yes we now know that isn’t the case, but it should be noted that EMR’s will eventually help with these initiatives IF providers have an enterprise data strategy and infrastructure in place to integrate EMR data with all the other data that litters their information landscape AND they have the right people to leverage enterprise data. Same can be said of Big Data. It should be relatively easy for providers to develop a technical foundation that can store and manage Big Data compared to the time and effort needed to leverage and capitalize on Big Data once you have it. For the significant majority of the industry the focus right now should be on realizing returns in the form of lower costs and improved quality from integrating small samples of data across applications, workflows, care settings, and entities. The number of opportunities for improvement in the existing data landscape with demonstrable value should be top priority to mobilize stakeholders to action. Big Data will have to wait…for now. Big data is in the news this week. 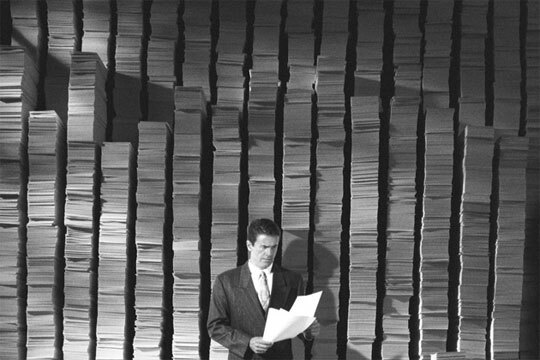 In a recent Forbes article describing the hidden opportunities of big data, Albert Pimentel Chief Sales and Marketing officer at Seagate quoted Mark Dean, an IBM fellow and director of the Almaden Research Center as saying, “Computation is not the hard part anymore.” As with most big technology transformations, one of the hardest parts is always getting the process and people part right. Big data has the potential to position businesses to outperform their competitors, as described in a recent McKinsey article that dubs big data the next frontier for innovation, competition, and productivity. As businesses race to implement big data technology, there are some serious business process transformations that need to take place to fully leverage the investment in any big data initiative. These processes cross the more traditional high level process siloes of “Manage Sales, Manage Marketing, Manage Customer Service, ” which were usually organized along departmental lines. What actions will be taken based on the actionable intelligence that big data provides? Initiatives across departmental siloes must be closely orchestrated or the customer experience will become chaotic and confusing. Marketing campaigns have to be coordinated with activities across all customer facing roles in the organization. Effective enterprise program management is critical to this successful coordination. Marketing has to be thought of less as a department and more as a shared business responsibility. What strategies and processes do you use to influence customer behavior on your website, in your retail outlets, at virtual and real time events? Are they working synergistically, or are they are crossed purposes? What change management principles do you apply to shift customer attitudes towards your company, your employees, your products? Are you fully leveraging the power of third party change agents, or only applying traditional, direct influence measures? Are our processes too rigid to allow us to be a world-class, big data-driven organization? Should we concentrate on defining broad strokes strategies instead?